how could I convert an audio file such as a aiff into a svg using gnuplot? I used sox (sound exchange) to convert an .aiff into a .dat, which I can load now in gnuplot. I get a svg file, but only with dots / or a lot of x. How could I connect the dots? With large files you may also find it useful to plot only every nth sample with "every n". This will make the plot much faster to generate and will also yield a smaller (but less detailed) svg file. you can add the following to have gnuplot consider those lines comments and ignore them. This will save you having to pre-process your .dat file in order to remove those lines before gnuplot chokes on them. If you're working with a stereo file, you probably want to see both channels. 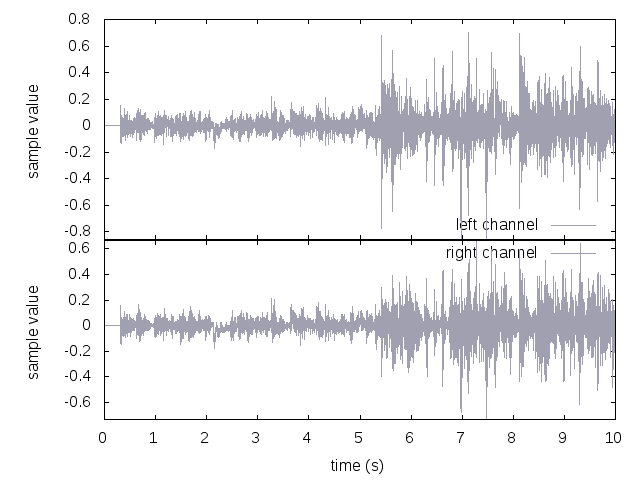 We can use "multiplot" to lay out the following two plots (of left then right channel) one above the other on a shared x-axis, as many sound-editing programs do. Putting it together: Here's a script which puts all of the above together. If you don't have a stereo data file to try this with, you'll want to remove the plot of 1:3 and the multiplot setting. plot "test.dat" using 1:2 every 100 with lines lc rgbcolor "#a0a0b0" title "left channel"
plot ""         using 1:3 every 100 with lines lc rgbcolor "#a0a0b0" title "right channel"
Big file warning: Converting even just 10 seconds of stereo audio at 40kHz will produce a 25Mb output file. Just wanted to document this - well, I was looking for a long time for a Linux command line audio waveform viewer, which could be called from the command line, with a raw binary file as input, and where the format of the data could be specified on the command line. Audacity can import raw data, but only from the GUI (there is no way to specify raw datafile format through its command line options); while wave viewers like gwave, gtkwave or Gaw - Gtk Analog Wave viewer can either read proper .wav, or SPICE based formats. gnuplot -p -e "set terminal x11 ; set multiplot layout 2,1 ; plot 0 ls 2, 'data.raw' binary format='%int16%int16' using 0:1 with lines ls 1; plot 0 ls 2, 'data.raw' binary format='%int16%int16' using 0:2 with lines ls 1 ; unset multiplot"
Not the answer you're looking for? Browse other questions tagged audio gnuplot or ask your own question.